I don’t like Mafia movies. I blame a college professor who made my film class analyze The Godfather for six weeks. But I was intrigued by trailers for The Family, a comedy about one such family in witness protection in France, starring Robert De Niro and Michelle Pfeiffer. So this morning I bought a cheap ticket and took a peek. 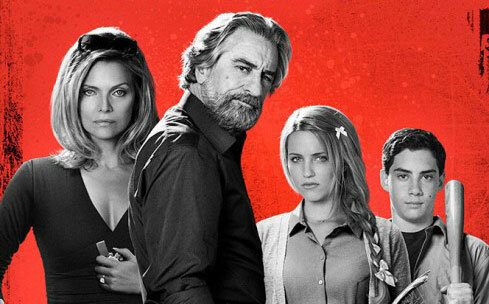 The Family is a black comedy — lots of laughs, but an equal dose of violence and blood. As weird as this may sound, I was happy to see the women of the family were just as tough — if not tougher — than the men. Word of warning: Don’t leave a tennis racket within reach of the daughter (played by Glee‘s Dianna Agron). And a star is born in young John D’Leo, who plays the son Warren. I’ve never seen him in anything before, but now I’m pretty sure he’ll be everywhere. This entry was posted in Celebrities, Commentary, Entertainment, Humor, Movies and tagged black comedy, blood, celebrities, commentary, Dianna Agron, entertainment, family business, film, France, GLEE, Humor, John D'Leo, life, Mafia, Michelle Pfeiffer, movie ticket, movie trailer, Movies, reviews, Robert De Niro, tennis racket, The Family movie, The Godfather movie, violence, witness protection program. Bookmark the permalink.